This fall I went to session at #IWLA18 with my friends Christine McCormick on using the principals of the book Whole Novel for the Whole Class. In full disclosure, I still have not read the book, but I took some of the ideas she shared, as well as those I have been reading about in teaching Facebook groups and just jumped in to try something new. My goal was to try reading a full class novel very quickly, as to not lose the story and drag it out to the point that students are over it. I have taught over 50 class novels over the past five years and was ready to try and mix it up for both myself and the students. Typically I spend about one day or two per chapter on a class novel. This means we usually spend about three weeks actually reading a book. These Spanish 1 classes have read the class novels El capibara con botas (in 8th grade exploratory) and Brandon Brown quiere un perro. They have also been doing free reading to start class on Tuesdays and Thursdays for the past month. 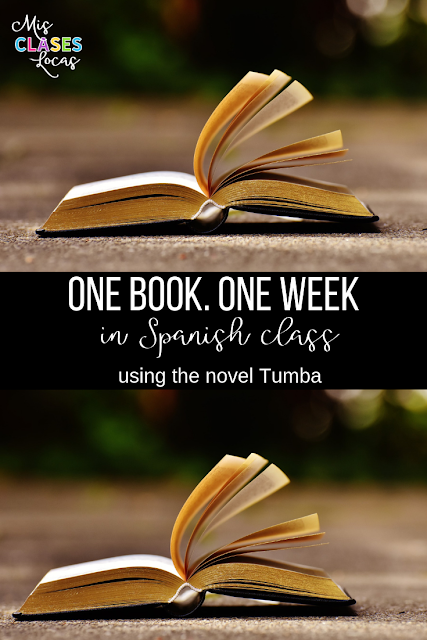 I picked a novel that I thought the would be successful with, Tumba. 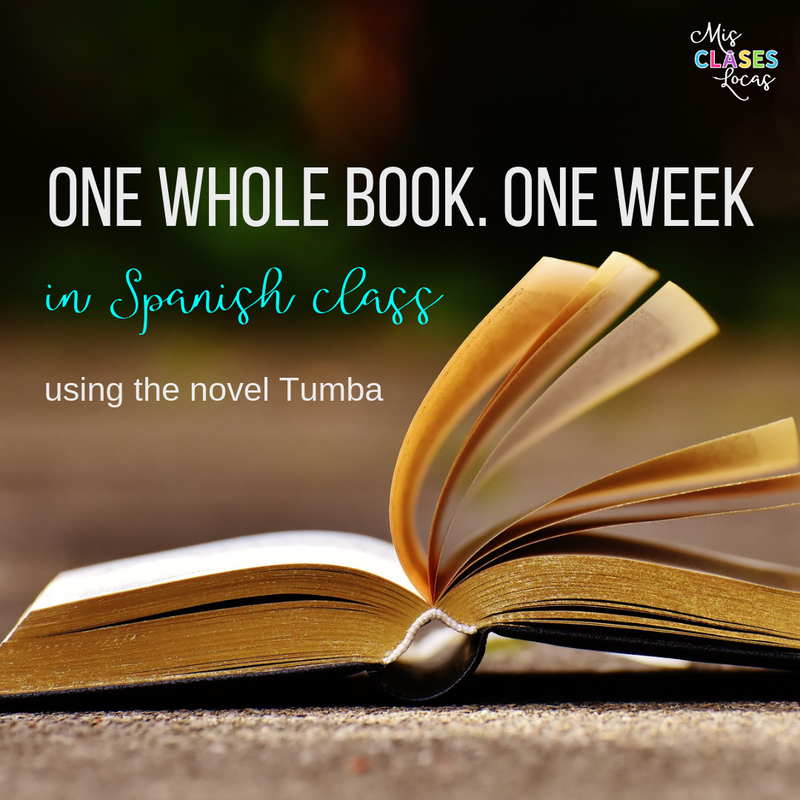 This is my sixth time teaching Tumba, so I have many activities in a giant slideshow from the official teachers guide, as well as many ideas I have shared in blog posts. 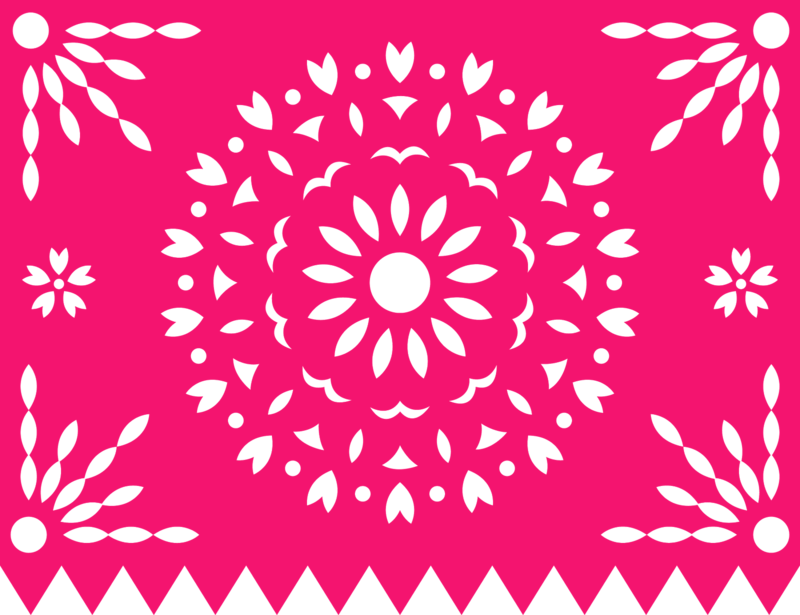 We spent three weeks building the background knowledge for the novel surrounding the Day of the Dead and other themes. We watched the movie Coco, as well as did the Day of the Dead unit from Martina Bex. We read a cultural reading about Mexico, as well as readings from the official teacher's guide about Calavera poems, schools in Mexico, the Mexican Revolution, cenotes, as well as asked personalized questions related to the vocabulary used in the book about descriptions, family and classes. We also did a Gimkit with vocabulary from the whole book. My TA helped me to create ten English True/False comprehension questions about each chapter. I printed these out for students to complete and check on their own after reading each day. Christine had recommended making self checking Google forms for these questions, but I ran out of time. Instead I had multiple keys on my desk that students borrowed to self check their mini quizzes each day. To transition to a faster paced novel, my plan was to read two chapters per day for a week, which was perfect for a ten chapter book. Also, it was recommended to have students read it all on their own, but I knew some of my students were not ready for that, mostly due to maturity and a lack of ability to self manage. I used a variety of ways of reading, depending on the section. I read chapter one to the group. Then they read chapter two alone or in pairs. Students completed the true/false English comprehension and then self checked with the answer key at my desk. With extra time students could chose to complete a manipulative timeline over chapter 2 or activities from the novel slide show posted on Google Classroom. I played the audio book and we did "silent actors" with students acting out the scene for the class. I paused between chapters to discuss in Spanish. With extra time students could chose to complete a manipulative character sort over chapter 3, a chapter 3/4 worksheet or activities from the novel slide show posted on Google Classroom. Students read the chapters in small groups. I gave the option of reading with me as well. With extra time students could chose to complete a manipulative sentence ordering activity for chapter 6 or activities from the novel slide show posted on Google Classroom. Read Chapters 7 and 8. With extra time students could chose to complete activities from the novel slide show posted on Google Classroom or prepare for their listening assessment. Read Chapters 9 and 10. (A small group with me and others on own or small groups). With extra time students prepared for their writing assessment, as well as wrote questions for our guest from Mexico the next week. On Friday I asked all students to give me feedback on reading a novel in one week. Overwhelmingly, they preferred it. They stated that they could follow the story much better in a shorter amount of time and they enjoyed the book much more than the books were read over multiple weeks. They really liked having the English comprehension questions and getting to move quickly through the story. There were a few students who said they prefer reading over a long period of time, most who either missed a day, or have low overall motivation. They also mentioned how they were glad that we spent time learning about things discussed in the book in advance. Students said knowing about Day of the Dead, cenotes and the Mexican revolution helped them better understand the story and the vocabulary used throughout. They also felt pretty accomplished, reading a whole book in just a week. Overall it was a big win and now I want to try this style again with other classes and levels. Have you tried reading a book in a week or less? How did it go? What tips do you have to share? For those of you on break, enjoy! If you are teaching like me, check out this post with no prep ideas! What a great idea! It never occurred to me to read a novel so quickly, but I always have kids complaining that we're dragging them out. Have you noticed any downsides? What do you do for kids that were absent? Could you see yourself planning all of your novels this way? Thanks for sharing!! I did tell all kids the plan for the week in advance, so if they had a planned absence, they knew they needed to read. A couple who missed did have to catch up, but having the English comprehension T/F helped them self assess. Great post!! I really like that you gave your students choices on follow up activities each day, and those choices allow for differentiation. You mentioned activities associated with the Tumba Teacher's Guide. What type of activities did you create? Thanks again for sharing. The English T/F questions were created, but everything else I pulled straight from the guide! This post came at the perfect time. Thank you. I'm trying it next week. Two questions: what amount of time would you spend before a novel on vocab and culture typically? Also, do you let students, especially absent students take their books home? I appreciate your time! Yes each student is checked out a book and can take their book home if they will be gone. It all depend on how much new culture and vocab there is. We spent about 3 weeks, but that is because I had a lot of fun stuff for day of the Dead to do. I think if you are going to read a book fast, it needs to be set up so students will be successful. Thank you so much for this post! I have been toying with the idea of reading "faster" with novels as a few of my classes in the past have complained about it taking too long. I've just always been nervous that I'll lose some kids or that they won't understand enough from the book...but I haven't considered doing that much work ahead of the novel and how that could impact the pace at which we/they read. You've got me convinced to try it! Thanks! I'm curious how students prepared for the listening assessment? Did you show them the pictures in advance and have them describe to each other? We did not, but that is a great idea! This entry came at the perfect time for me. I had just begun "La Llorona de Matzalán", later in the semester than I had planned to, like always. There's still no way I'm going to get the book finished before Christmas, but your ideas are helping me move more quickly than I normally do. I especially liked the idea of T/F quizzes after each chapter as comprehension checks, and putting them in a self-checking Google Forms is great! It's so easy to see see what students understood, and who needs a little more scaffolding to understand what we've already read before we move on. I still don't think I could get a book done in a week, but these ideas are really helping me make some good changes to my approach to the whole class novel. 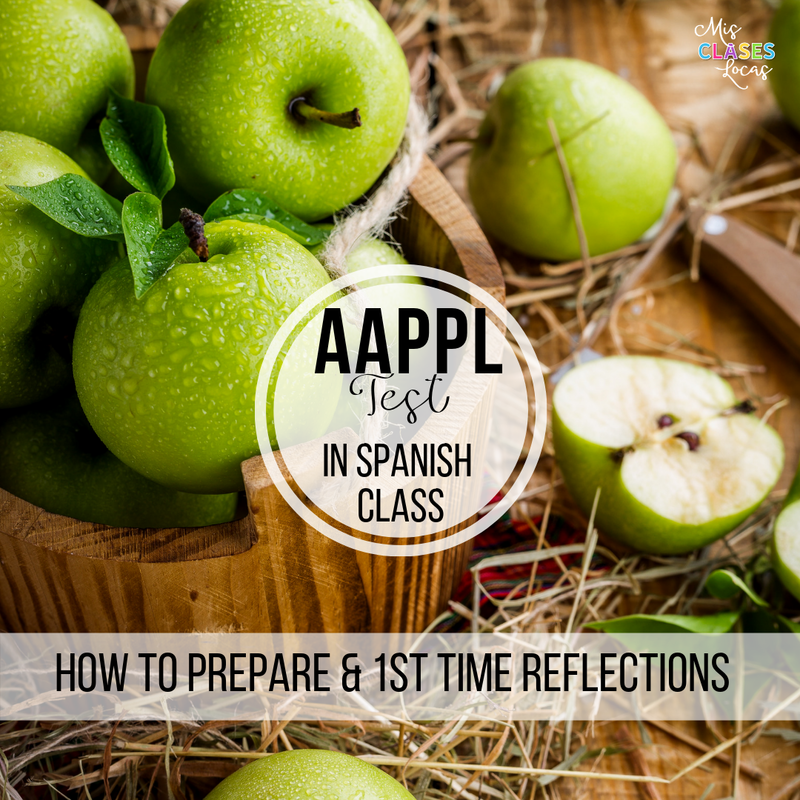 As you taught this book to Spanish 1, I'm wondering how you handled the brief use of past tense in the book? Through context, it makes sense and students did not question it. We did pop up grammar if needed to show when referring to the dead abuelo they used gustaba. 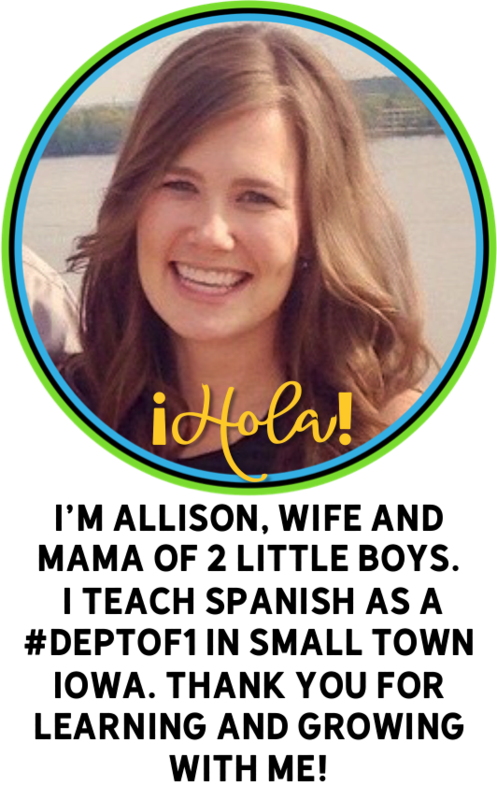 Hi Allison, I'm curious... you mentioned several times above that students could choose to do activities "from the novel slideshow posted on Google Classroom". What exactly did you put in the "novel slideshow"? Would you be willing to share one of your "novel slideshows" so that I could see what one looked like? Thanks! My slideshows are basically all of my favorite activities from the official teachers guides. I am sorry, but due to copyright, I can not share them.